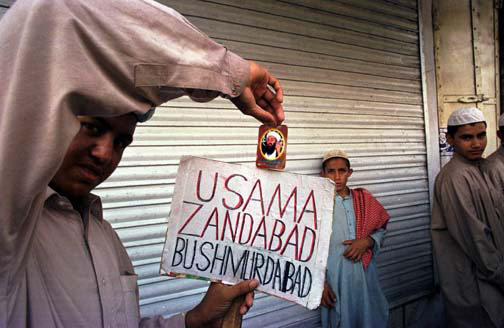 Rawalpindi, Pakistan — “Long Live Osama, Death to Bush” reads a sign in Rawalpindi, during anti-US demonstrations on Friday in Pakistan. 10/05/01. Photo by Bikem Ekberzade. Last week Elijah J. Magnier, an analyst/reporter with the Kuwait based Al Rai media, published an article on his blog, deciphering Baghdadi’s speech from December ’15. The gist of Eli’s analysis was that Baghdadi’s speech confirmed the notion that the jihadist group was losing power, as its main source of finances was running dry. However, IS disintegrating in Syria, as Russian bombardments keep cutting its lifeline by destroying refineries and truck convoys shipping cheap oil, is by no means a news to celebrate. Nor is the strategy shift in the aerial raids from U.S. and allies’ “do not harm infrastructure” to Russia’s “total obliteration” will benefit the civilian population either on the run, or stuck in the country and about to become part of the civilian casualty statistical roundup. The situation in Syria is more complex than one party merely gaining ground upon another. It is one with multiple dynamics. And armed groups with acronyms do not disappear, they just change form. As the destruction in the IS strongholds in Syria mount, and as IS cannot ship oil for cash, it is sure to crumble onto itself, yes. Little that we know of the military structure of the jihadist group points to regular salaries being paid to its fighters. That alone has been one of the reasons it managed to upkeep a vast diorama of foreign fighters both professional (the Chechens) and amateur (the “disillusioned” first generation Europeans and Americans) as well as certain warlords and their fighters from African countries (Libya, Sudan, Somalia) But once that is cut will they be gone? Hardly. The refugee influx is already changing shape from people who ran from the Islamic State to people who are running as cities are liberated from the Islamic State. Not one armed group has a clean slate and massacres and mounting civilian death tolls are call signs each group leaves at their wake. “Shoot first, ask questions later” is a norm in conflicts as proxied and thus as complex as the one in Syria. Alliances are formed. Then, as dynamics change and relations turn sour, new alliances are formed among groups you think would be the most unlikely parties to stand side by side and pose for the camera. Those that are not flexible enough are ousted gently, are brushed off to the side waiting for their turn to get back in the game. Turkey is one recent example. Having thought of itself at the heart of the anti-Assad coalition, hoping to shoulder its way -and thus the way of Muslim Brotherhood- into Syria, now finds itself watching from the sidelines as US and its European allies sketch out a transition period with Assad, at least until the next round of elections in Syria. They are even willing to throw in a bonus: Assad’s party may be permitted to run for re-election if it chooses. Now that is not such a surprising turn when you think about the millions of refugees that are spread all around the Middle East and North Africa waiting for a relatively safe passage to Europe, and the involuntary conflict they may be carrying with themselves in their travels, one that feeds from racism and prejudice. Those qualities of inflexible societies feeding on fear of being taken over by people they believe are different than them, are enough to ensure the temporary relaxation, the false feel of safety will soon give way to devastating bitterness for the newcomers. We have seen explosions of anger, frustration all accentuated with the feeling of helplessness as refugees lashed out at the security forces at several entry points on the island of Kos after their perilous journey across the Aegean this past summer. The accusations of sexual assault that the refugees in Germany’s Cologne have been faced with seems to mirror the fears and bigotry the native population, even maybe inadvertently, harbors towards newcomers. For starters, it may be useful to remember the definition of a refugee as it is stated in the Geneva Convention. Secondly, some common sense could do the trick: if you were fleeing because your life was at risk, your number one priority wouldn’t be going around groping your host. So, it will be interesting to see what the assault allegations against the refugees who have been detained and are currently being kept in custody will reveal. I won’t be surprised if the whole ordeal ends with only leaving additional trauma to that of being a refugee. Thus, as destruction in Syria mounts from merciless air raids, totaling everything from hospitals, to schools, to civilian areas, as the swift return of refugees to their homes even if the fighting ceased in the country this very day seems hardly unlikely, and knowing that IS will never go away (as the Taliban never did, nor did Al-Qaeda) and since the war in Syria is already being planned by the gods of war to continue for at least a decade should foreign intervention continue (and it will, as Syria is proving to be a prolific marketplace for weapon manufacturers,) IS is not going anywhere. The outreach techniques of the jihadist group, making vast use of social media through its propaganda channels plus a few hired pens, and some covert sympathizers will continue to saw seeds among the younger generation: mostly children of migrant families who had fled their lands in some other era during some other war most of us already forgot about. You do not need to be a devout Muslim to be spiked off by IS propaganda. A hunger to be a part of something taking over the void of not fully belonging to any one place is all there is to becoming the next Abdelhamid Abaaoud. Gilles Kepel in his book Jihad: The Trail of Political Islam underscores this theory multiple times. I will take that one step further. Unless the developed world stops its hypocrisy and sincerely tries to relate to the groups of people seeking refuge within its borders, further conversion of young populations to violence will be inevitable. Being part of any particular theological/ideological union acts as a code, a bind, and a necessity. But the promise of untethered violence, a fleeting (and often false) chance to get even is often more appealing than a strict disciplinary code. We know that from the fluid nature of rebel factions and their splinter groups in Syria who keep on exchanging fighters in between themselves. Jabhat al-Nusra is not that different in technique or level of violence than Ahrar al-Sham or IS. When it comes to establishing their legitimacy in a newly conquered area they all just behead and move on. That said, IS also knows that their days as we know them are numbered. They always knew. Or would have known if they had studied armed movements who lead a fight of ideology against the powers of establishment. Unless alliances shift in their favor and stay that way (hardly, ever) time always acts against them. First there will be break offs, factions. Then they will be followed by further break offs, splinters. And those splinters will often go rouge (one great example is the Shankill Butchers a splinter off the Ulster Loyalists around Belfast area in Northern Ireland back in the Troubles) Then a new and more powerful movement will oust them all together. In the case of Syria, the western allied forces are now diversifying their options betting their money on the Kurds, Assad and al-Nusra all at once. With Russia and Iran also backing Assad, the fall of IS is already cashed in. So the only wild card left is the potential splinters that will blow up everywhere once IS is out of the picture. As the powers that be are fighting their proxy wars in Syria, the mainstream media is too busy following on their heels. But the story, as always is the case, is unfolding elsewhere: in lands such as Afghanistan and Libya. The litmus test in Afghanistan has always included the Taliban. At times when the Taliban grows weak, you know some other jihadist movement is gaining foothold or expanding its influence in the region. Although initially carved as such, thanks to the Soviets and the Americans, Afghanistan never really had a shot at being a country. Shah Masood was possibly its only chance, and two suicide bombers took care of that for good exactly two days before 9/11. With Masood gone, it was business as usual, the corrupt puppet government of Hamid Karzai and the ineffective Ashraf Ghani only ran the international political stage, nothing more. 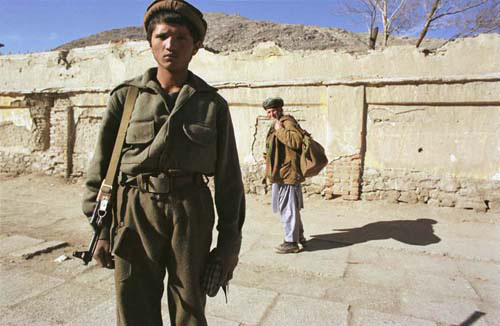 Out in the field the defining force has always been warlords, and with Masood’s secular Tajik fighters slowly disintegrating after his death, the Taliban. Al-Qaeda’s presence in the country was in regions it carved itself from the Taliban. And now those areas are being slowly handed over to IS. Opium, the single source of Afghan farmers is back on the market. And being on IS payroll is the only other employment opportunity available. On Frontline’s ISIS in Afghanistan from November 2015, reporter Najibullah Quraishi timidly follows his leads and shows us a little bit of the extent of IS’s reach in the country. The short documentary’s high moment is not in the classroom where the children are being taught “the ways of jihad”, we can tell that is a set up for Quarishi to film, the children are not the fierce indoctrinated kids, and the teacher by whispering them the answers guarantee that. Nor the men allegedly on IS’s payroll and subsequently on its roster as jihadi fighters sharing a meal underneath a tree are more than a group of locals happy to see a paycheck and grateful for the opportunity of being able to take food home to their plates. Poverty and hunger are their everyday reality and their alternative to a “job” with IS. With no-pay Taliban at bay, joining the Islamic State is their only viable option for survival. So Islamic State has long been buying its way into a secure retreat should its scheme in Syria fall. Baghdadi understands better than bin Laden that money is more powerful than any ideology in the long run. And when hungry, man can do anything, including turning onto its own. So, as his days seem numbered – ceteris paribus – in Syria, expanding into Afghanistan or Libya seem plausible. But as in any mutation, the next version, let it be an actual strain or a splinter carrying the original DNA code but building up on it, things get only uglier with any metastasis. And amidst all this mindless violence and struggle for power and permanence, it is humanity that perishes.